It is natural to start feeling more flexible and confident after practicing yoga for a few weeks. When this happens, students, in their home practice, often push themselves harder, taxing their flexibility. Eventually, all the excess stretching is likely to result in problems like joint inflammation. It is common with yoga students to get ambitious that way. 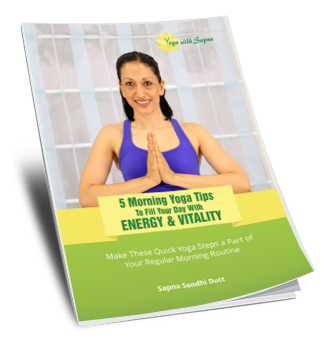 This is why, it’s helpful to keep the three pillars of yogic lifestyle in mind Ahimsa, Satya, and Aparigraha. I ask my students to be kind to themselves (ahimsa), to be honest with themselves and others (satya), and to let go of all expectations so that they are content with their current state of progress (aparigraha). During balancing poses or other asanas, where your whole body’s weight is on your wrists or ankles or both, keeping fingers and toes together can cause muscle and joint pain. These poses include downward dog pose, crane pose, crow pose, upward dog pose, etc. How to avoid this mistake: Spread your fingers and toes like a frog to distribute your weight evenly. Press through your fingers in a way that the palm forms a small arch inside. In poses, like the Warrior pose and its variations, the knee must be exactly above the ankle or then bent slightly in towards the body. The knee should never be placed forward of the ankle because in this position there is an excessive strain on the knee joint. Similarly, in the plank pose the elbows are supposed to be directly above the wrists, not flaring outside, nor pointing inwards. How to avoid this mistake: Spread your fingers and toes and press them into the mat. Take help from you yoga teacher/friend or a mirror to correct your alignment. While performing splits or wide-legged postures like the warrior one and three, make sure your toes are pointing in the same direction as that of your hips squared. A lot of people shrug while performing poses like the cobra pose, which compresses the shoulders and that could cause muscle strain. By raising the shoulders up toward the ears, people limit the support that muscles in their arms, shoulders, and neck provide. How to avoid this mistake: Breathe and let go. Take note of your breath and if you are holding it, it’s likely you’re hunching the shoulders to your ears. So, before getting into the pose, like a cobra pose, breathe out and as you rise up, breathe in deeply and then while you hold the posture, continue to breathe normally. Even if you don’t practice yoga, you know how amazing spine twisting is; it relieves you of pent up stress. However, it could also lead to bruised intercoastal muscles (muscles that lie between ribs) if done in an improper fashion. How to avoid this mistake: Lengthen the spine before twisting. Stretch your neck and back upwards to lengthen the spine and then twist to the point that you start feeling the stretch. Anything beyond that could cause strain. Lengthening the spine can even extend your range of motion and provide great relief. This is a very common sight in yoga classes during forward bends. I correct a lot of rounded spines in my class too. Because of rounding, the spine flexes in the direction opposite to where it’s supposed to, which strains the lower back and induces pain in that area. In fact, we should try and concave the lower back when we stretch into forward bends. This doesn’t really make the lower back concave , instead, it helps in flattening it out and arranging the muscles on both sides of the spine in better symmetry. Mostly, the culprit for lower backache, due to a rounded spine, are tight hamstrings. So, if you struggle to stay straight and narrow, bend your knees a bit during forward folds, or place a block, rolled blanket or cushion under your knees, if seated. This would take the pressure off the knees and help you strike a better pose. Also, do not forget to keep lengthening your spine as you descend forward. If you spend your days sitting, be it at home, in class, or in office, then you are most likely to have tight hamstrings. As a result, it is easy to over-stretch them by pulling them excessively during forward bends. Using props can ease this pain. However, a lot of us, over-estimate our capacity or try to challenge our bodies by not using props. How to avoid this mistake: Start thinking of props as your friends in yoga. Use them to modify your poses. If your body feels tight in some areas, then there should be no shame in accepting that and using props to accommodate. First, start working with props, and your joints will gradually loosen up and muscles will stretch and lengthen, after which you will be able to perform the complete pose without injury. This is yet another mistake that students make; snapping out of postures and hurting themselves. People usually take their time to get into a pose, gradually deepening it, but when asked to come out of it, they often unfold almost instantly, as if the pose was really strenuous. How to avoid this mistake: If you are one of those who snap out of poses, then you must shorten your duration of holding the pose still and dedicate the saved time to coming out of the posture with control. The rule of thumb is to move out of the pose as slowly as you worked your way into it. That’s creating a balance in the physical practice of yoga. Often when people try to get a pose right, they concentrate so much on keeping their bodies stable that they forget to breathe out. This is a terrible mistake to make. One might not realize its effects until the body feels more stiff, instead of feeling more open and flexible, after yoga. Because holding the breath interferes in the free flow of energy (prana) and oxygen and creates tension and stress in the body. How to avoid this mistake: If you find yourself holding your breath during the performance of postures, then take that as a signal that you’re pushing too hard. So, take a break, breathe actively for some time (abdominal breathing), and re-join the class when you feel that you have regained control over your breath. There are always a few students who enter the class just after the warm-up has ended and head to the door as soon as we call an end with Shavasana. And, that is harmful to the body. Just like any other physical activity, warming up and cooling down form an important part of yoga. While basic stretches prepare the body for the challenges ahead, cooling down with Shavasana relaxes the nervous system, calming it down to the pre-flow ritual. How to avoid this mistake: Just don’t rush into or out of yoga. Give your body the time it needs to prepare for the physical activity it is going to perform. Take time to cool down. Stay for Shavasana. 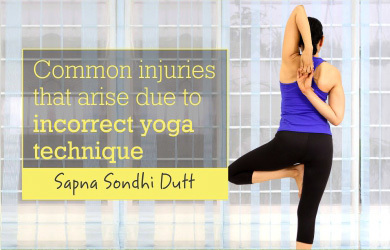 Common yoga injuries are bruises, bumps, sprains, etc. Just listen to your body. Stay mindful so that any stiffness or sensitivity doesn’t go unacknowledged and, once you know what’s bothering you, work your way to get rid of it. Towards building a healthy relationship with our mind, body, and soul.